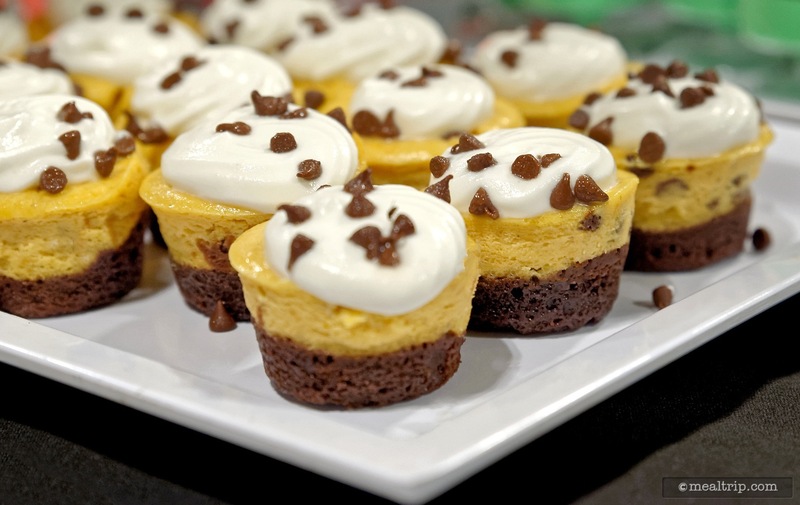 Beginning in 2015, the Happy HalloWishes Dessert Premium Package includes a special reserved viewing spot on Main Street for Mickey's "Boo-To-You" Halloween Parade followed by a private dessert party with Halloween themed desserts on the Tomorrowland Terrace. This area offers a large viewing area to see Cinderella Castle and the HalloWishes Fireworks (which will appear slightly to the right of the castle from the location). Reserving a spot for this package does not include admission to the park. 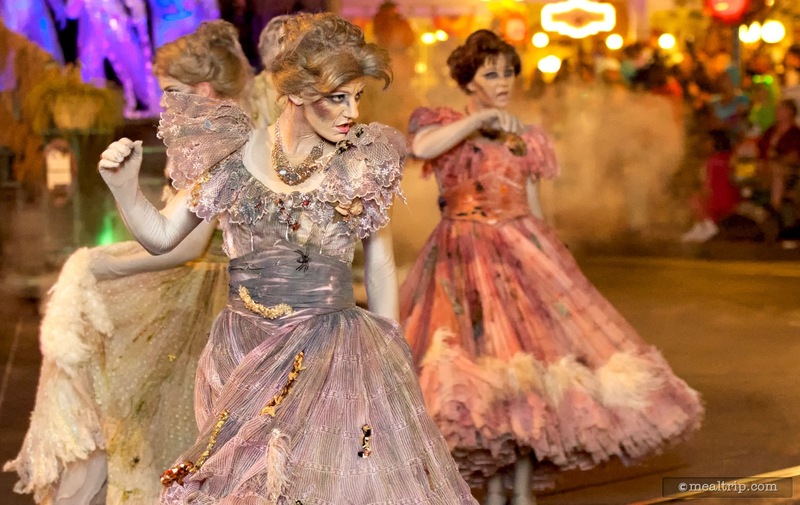 The event only takes place on select nights, during the Mickey's Not So Scary Halloween Party. You will need a separate Mickey's Not So Scary Halloween Party ticket to attend this Happy HalloWishes Dessert Premium Package event. For 2015... 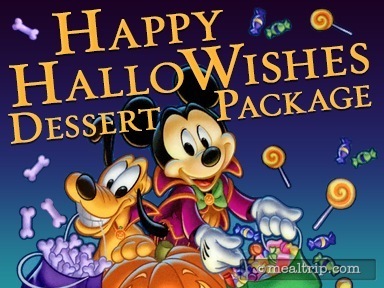 The Happy HalloWishes Dessert Premium Package costs $69 for adults or $39 for children (ages 3 to 9) which includes tax. A separate Event Party Ticket is also required, and is not included in the price of the package. Reservations are highly recommended as the package often sells out before the first Mickey's Not So Scary Halloween Party begins. 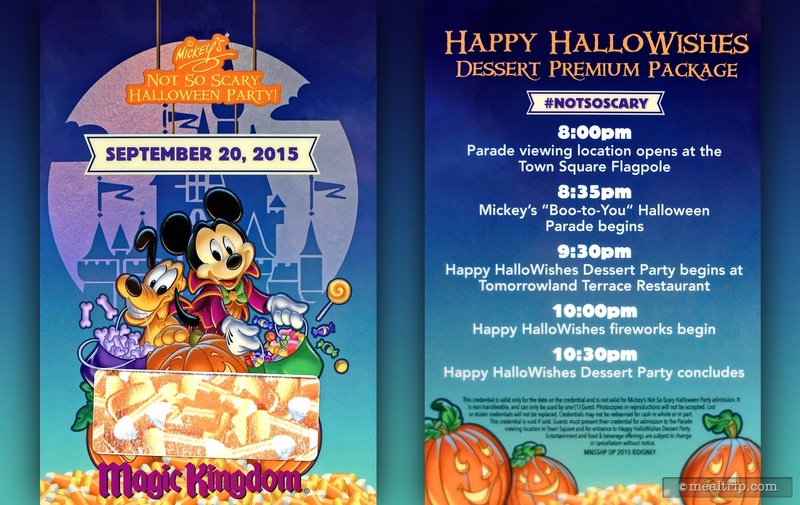 The Happy HalloWishes Dessert Party Premium Package is a special event, inside an event. 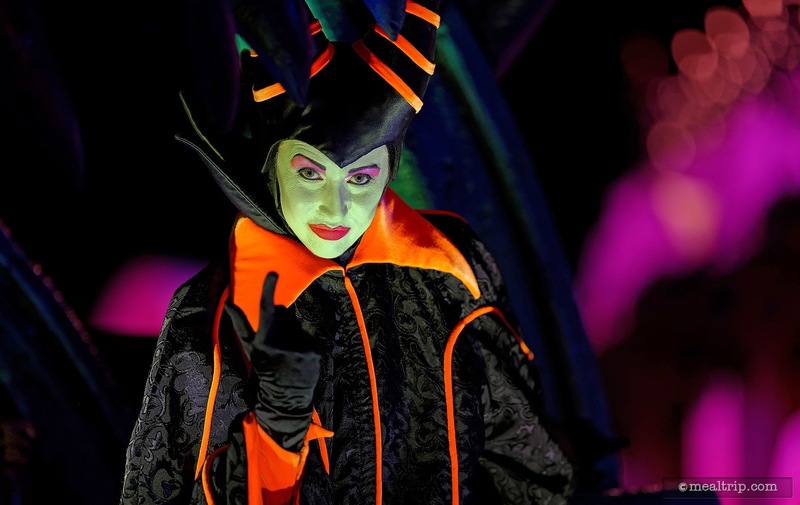 Taking place only during nights that Mickey's Not So Scary Halloween Party is occurring means that you will have to buy tickets to both events, in order to attend the Happy HalloWishes Dessert Party. Your event credentials can be picked up at the Will-Call area before entering the park or (presumably), at the parade viewing check-in location, or at the dessert party location itself. A huge benefit of the Premium Package is reserved viewing for the first Mickey's Boo-to-You Halloween Parade of the evening. While it's true that many guests view the first parade, staking out curb-side spots as early as 90 minutes before the parade begins, some have mentioned that watching the second parade is easier. That may have been true years ago, but increasingly, people are waiting for both parades in equal numbers. If there's just two people in your party, its' a little easier, but if you're trying to find space for groups of four or more, to sit side-by-side as a group… plan on grabbing a spot 60-90 minutes before the parade starts. Happy HalloWishes Premium Package guests will find that most of the hub on Main Street has been roped off, and is being held just for them! The area does open around 90 minutes prior to the first parade, so if you want the quintessential "straight down Main Street with the castle in the background" spot, you'll still need to get there early. However, if you just want a curbside seat to view the parade, the whole area doesn't really start filling in until 30 minutes prior to the parade. 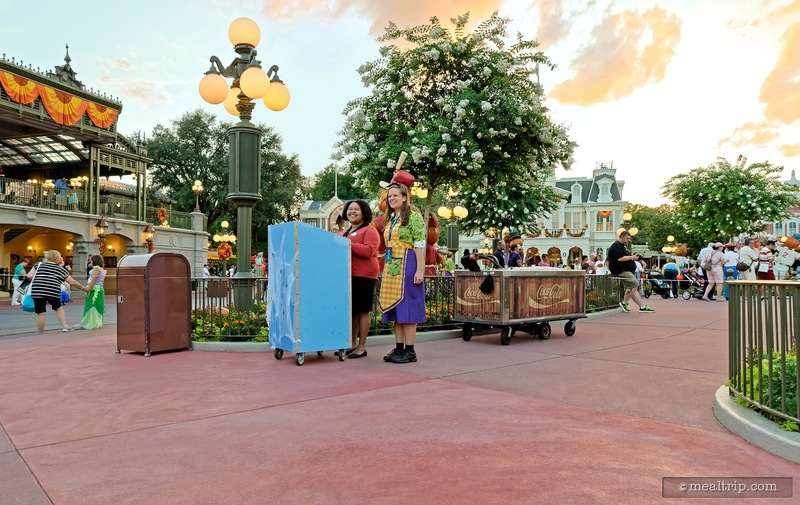 There's an area check-in podium across from Tony's in the center hub area, and guests have access to free bottled water that's being kept cold in a giant cooler on wheels (another great perk on hot evenings). Even getting to the area last minute… there's still a good chance that you will have a curbside view. The viewing area in the center hub wraps around from a "down Main Street" view, all the way around (on the Tony's side), to an "in front of the Train Station" view. It gets a little dark when the parade starts, but from what I could see, there was no "two-deep" standing anywhere around the hub. Everyone who was in the HalloWishes Premium Package, got a front-row seat (or stand, it's up to you). Parades are… slow moving... so a kick-off time of 8:35pm would mean that the bulk of the parade doesn't reach this Main Street hub area until 9:00pm. Once the parade is over, guests are free to roam and/or make their way to the dessert party area, which is being held in the Tomorrowland Terrace veranda. This is the same location that the Wishes Dessert Party is held on non-MNSSHP nights. There are a few event guides available to walk the group directly over to the location via a back-street area. My guess is, if you're in a hurry, you could probably beat the group to the area on your own… it just depends on how busy Main Street is. 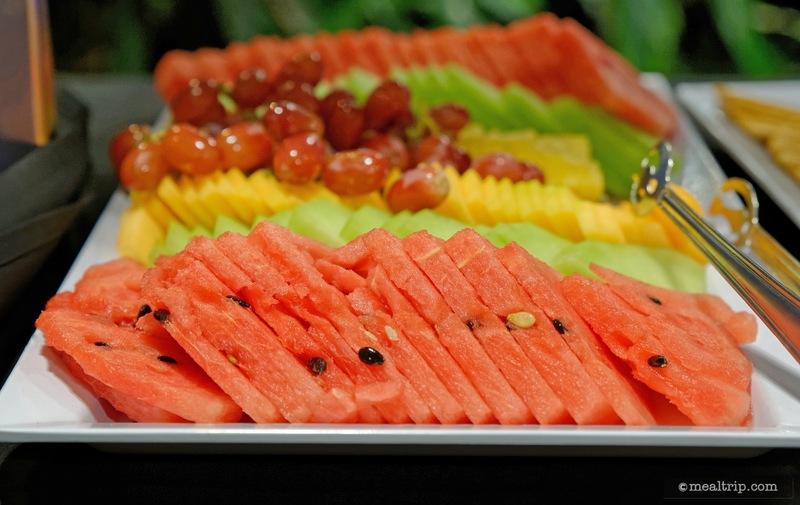 There's ample time to get your fill of desserts though, and everyone has a reserved spot at the dessert party as well. Some guests stopped in for photos at Mickey's Town Square Theater location before going to the dessert party… so there's no need to rush… it's up to you. Once at the dessert party location, guests were quickly checked in, thanks to the numbered ID credentials that everyone was wearing! This went so much smoother than at a "normal" dessert party… as the line to get in, can get quite backed up. Most Happy HalloWishes Dessert Party Premium Package guests already had numbered credentials and a quick name check was all it took to get into the dessert party area. Everyone gets to pick out a flute of apple cider (and just like the normal dessert party, it's non-alcoholic), and as you are escorted to your reserved table, a toast is made to and with your group. 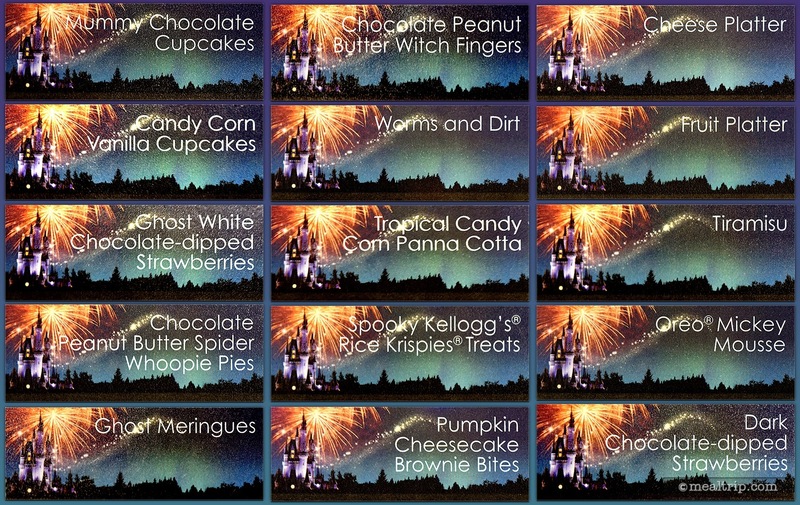 Having been to the normal Wishes Dessert Party, and now the Happy HalloWishes Dessert Party… it almost seems as if your event guide is desperately wanting you to make your own toast. So far, they seem a bit lost in the "toast" department… knowing that something is supposed to be said as you raise your glass, but not realizing that they are the ones that need to take control and actually say something thoughtful and entertaining. Copywriting, is a lost art… but a few choice, pre-scripted words for the ceremonial toast would go a long way! The actual pacing of the party felt a bit more rushed than at a "normal" Wishes dessert party. There was only a half hour of "dessert eating" before the fireworks began, and that's not much time for 150+ guests to make their way around a dessert buffet. 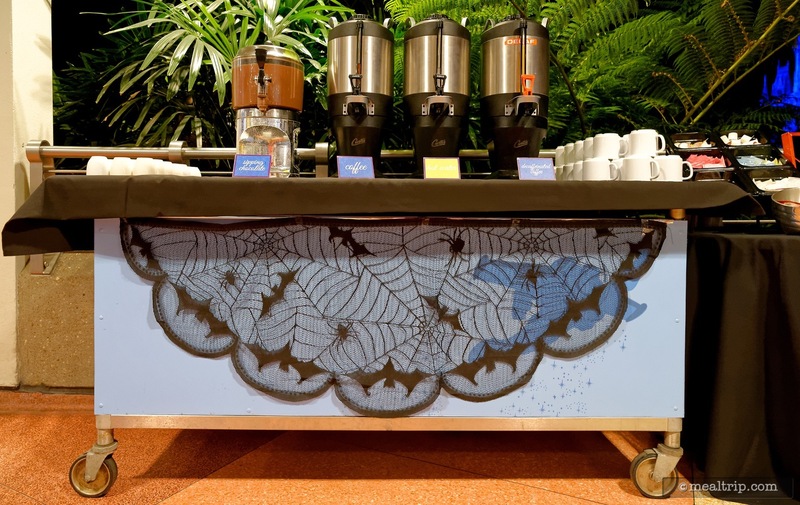 The dessert and beverage offerings are very similar to the Wishes Dessert Party event, but themed more to Halloween. 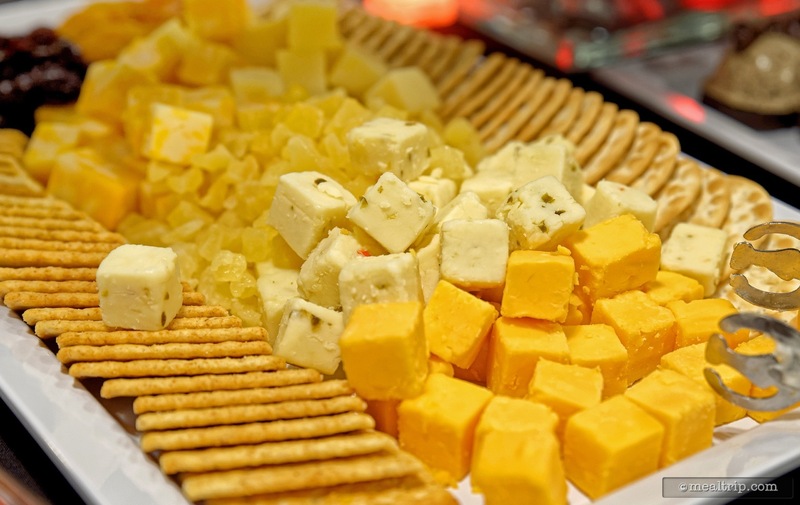 I didn't get a chance to completely cover some of the same desserts (such as the Sipping Chocolate or the Ice Cream Sundae Cart) in this review, because they're identical to the offerings at the Wishes Party. 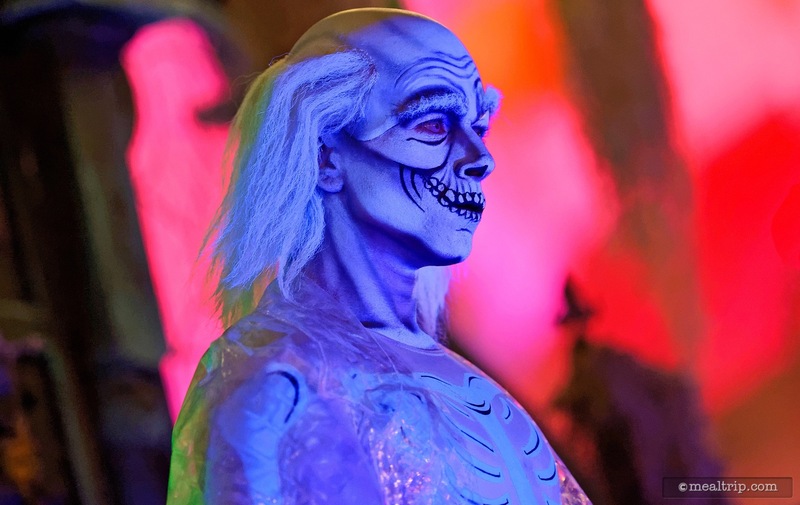 If you would like to read more about the "normal" Wishes Dessert Party event, click here to visit our Wishes Dessert Party page. 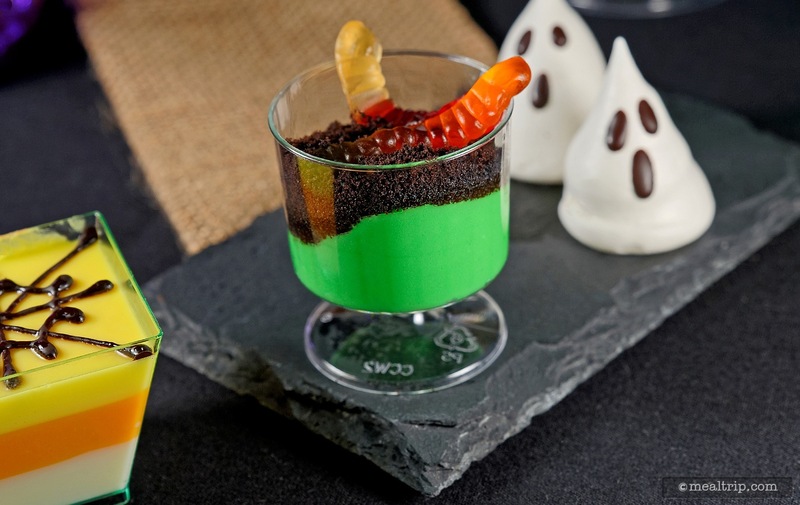 Strictly from a culinary standpoint, I felt the Halloween tweaks that were made to this dessert party, gave it a slightly less rounded, and more "sweet" feel. I can't really put my finger on it, but the nightly Wishes Dessert Party times seem more well balanced and even had a couple standout items. The desserts are all good, but I didn't come away with any "wow" favorites like I did with the normal Wishes Dessert Party. I was expecting a couple of nicely spiced "pumpkin" type of desserts, and nothing really hit that mark. There was a Tropical Candy Corn Panna Cotta that was really good, and a standout because it had a welcome mango punch to it. I'm not sure that Mango completely fits the fall/Halloween theme though so… great Panna Cotta… wrong time of year. From a decorative standpoint, there were some really cute desserts here. Just about everything had eyes! It's very cool walking up to the dessert buffet and realizing that the desserts are looking at you, at the same time you're looking at them! The cupcake offerings were a Chocolate Mummy Cupcake and a Vanilla Candy Corn Cupcake. If you have ever tried piping frosting on a cupcake… there's definitely an art to it. A mini cupcake, is even harder because the darn thing doesn't want to stand upright. The amount of production time and skill that went into decorating these little cupcakes is amazing, and I hope at least a few guests take the time to look at a couple of these items up close, and just think about how many hundreds of these things have to be made each night… by hand! Another visual standout were the Chocolate Peanut Butter Spider Whoopie Pies. The cake was light and spongy, the peanut butter filling was not only very light, but packed a lot of peanut butter punch, and someone actually took the time to shave a chocolate block to create tiny chocolate curls that became the legs for each "spider". 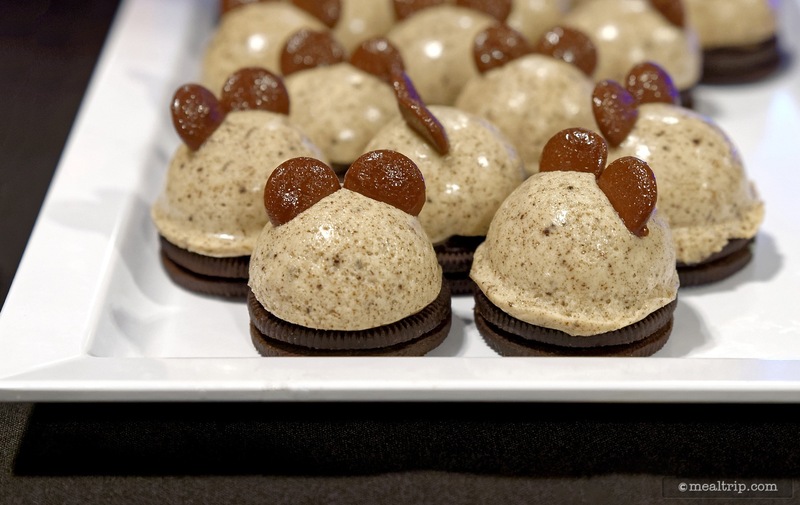 Here again… a lot of time went into making these desserts thematically look great… never mind that each spider only had six legs… the shear number of tiny Whoopie Pie Spider Legs that had to be made, and hand placed in the sides of each bite-sized spider is amazing! At 9:45pm (15 minutes after the dessert party starts) there is a showing of Celebrate the Magic (the light show projected on Cinderella Castle), and I think the show looks great from the dessert party location. True, you are not quite center and you are a bit far away from the Castle, but the colors and edges seem more defined from this distance. At 10:00pm (30 minutes after the dessert party starts) Happy HalloWishes (i.e. the fireworks show) begins. Most guest do get up and stand at the rails to watch the fireworks, but some stay seated as well. Certain locations on the veranda are better for staying seated and still being able to see everything. It really just depends on where you are located. Either way, there is plenty of room for everyone to stand up and still be "in the front". There's no "two-deep" standing if you are willing to walk one way or the other over the length of the veranda. It's worth mentioning (and I've included a few photos as well), that the fireworks are not centered behind the castle from this vantage point. Some guests don't seem to like that. Personally, I can see more of the actual fireworks from the dessert party location, and so I don't mind. You'll have to be the judge. A bigger visual issue, is that the special Happy HalloWishes display includes what are known as "perimeter" fireworks as part of the grand finale. You almost need to be able to rotate around 180 degrees to fully see all of them while they're going off. The dessert party location does have a bit of an overhang… which is great cover if it rains… but not so great for seeing all of the perimeter fireworks. You can pretty much look one way, or the other (depending on where you're standing), but you can't "really" see all of them from the covered location. That's a tough question to answer. If one were to put a value on these special experiences, I'd say the "normal" nightly Wishes Dessert Party is a better value. It's about 1/3 of the cost and the desserts are the same or slightly better than the Happy HalloWishes Premium Experience. It all seems to come down to the special parade viewing area. For anyone that's tried to find a spot for more than a couple people to watch the Boo To You Parade, you'll know that you have to put a lot of time into it… and even then, you're probably going to get squeezed in with everyone else trying to do the same thing. The parade viewing area that's part of the Happy HalloWishes Premium Package is luxuriously spacious, even if you wait to the very last minute to get there. There is no "two-deep" standing at the parade, as long as you don't mind which direction you're facing, and it is really nice to experience the street show with elbow room to spare. At $69 (on top of your special MNSSHP ticket to get into the park) it's not one of the least expensive dessert parties, but you do get a souvenir clear plastic "skull mug" full of candy to take with you! 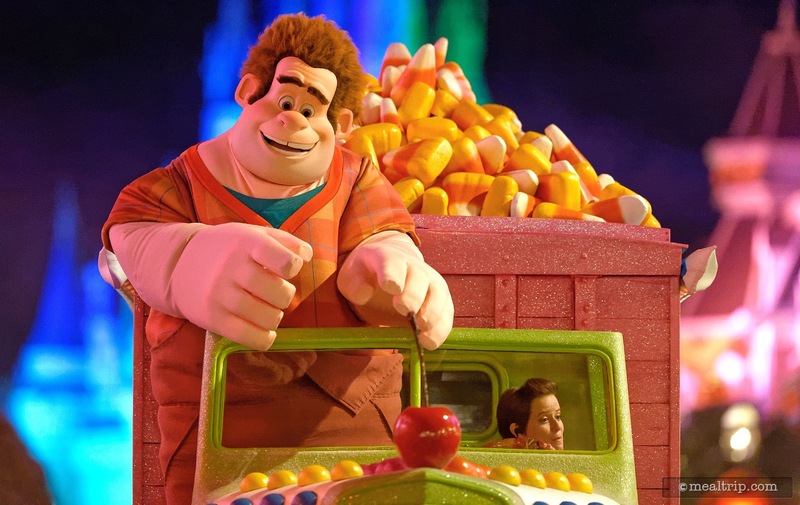 It is a great way to experience two of the party's main entertainment elements (the parade and the fireworks), but the dessert party part of the event feels just a bit rushed compared to the "normal" Wishes Dessert Party. 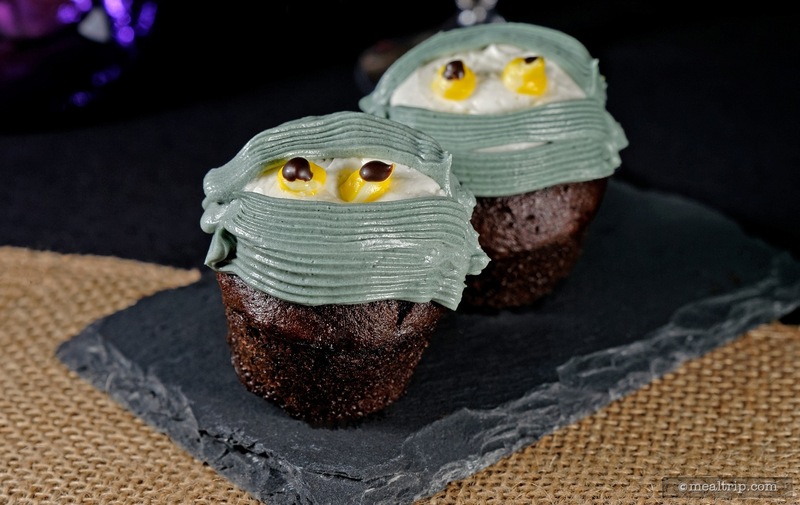 I enjoy going around to the various "treat locations" during Mickey's Not So Scary Halloween Party, and there was not enough time to hit them all this year… and… go to this special dessert party event. I did manage to get my special Sorcerer's Card, I saw the last "Hocus Pocus Villain Spelltacular" (the castle stage-show), and I even hit a few rides... but I imagine that if you wanted to add a couple of character photo meet and greets to your evening… you would have to give up even more treat locations. It's a lot to do in five hours. I would definitely do it again, if I didn't have a "must do" agenda, and just wanted to enjoy the evening for what it is. If you're on a mission to get photos with quite a few charters, or to absolutely see both parades, and watch the fireworks from the exact center of the park, or even hit all of the treat handout locations… the Happy HalloWishes Dessert Party may seem like it's getting in the way, and end up feeling like it took time away from seeing everything else that MNSSHP has to offer. I do wish there was a way we could get the Halloween themed dessert party… on nights when there wasn't a Mickey's Not So Scary Halloween Party going on, so that everyone would get a chance to see those great looking desserts… but then you would also be missing what ended up being one of the most valuable parts of the package… a reserved, walk-up location to watch the parade, with very little time investment. 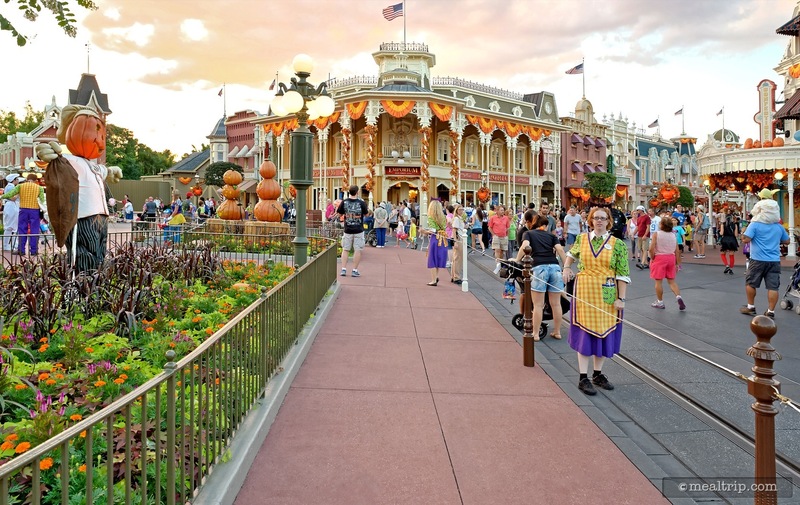 All in all, I would tentatively recommend it… if you've already experienced MNSSHP as a "normal" guest, and were looking for a slightly elevated experience. Let's face it, this special dessert party package can only accommodate 1% of the guests going to the main MNSSHP on any given night… so it is a premium, exclusive experience. CLICK HERE to view all 44 images in our photo gallery.